Holy Ghost Church held an Easter Egg Hunt and Spaghetti Dinner in the Church Hall on 29 March 2009. Everyone had a great time---sharing a wonderful spaghetti meal together, the children having fun hunting for Easter Eggs, making crafts and finally spending some time with the Easter Bunny! Please feel free to download any or all photos. 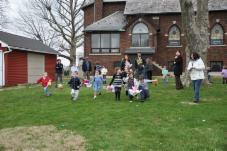 On Sunday, April 10, Holy Ghost hosted the annual Spaghetti Dinner and Easter Egg Hunt. 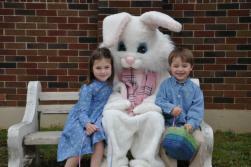 We had a wonderful time with dozens of children finding the hidden eggs, winning candy and prizes, and of course, a visit by the Easter Bunny! Thank you for everyone who helped make the dinner a huge success. Holy Ghost Church would like to thank Father Ihor Kolisnyk, the superior for the Redemptionist Fathers in Lviv, Ukraine, for providing a wonderful Lenten Mission to our parish during March 25 - 27. 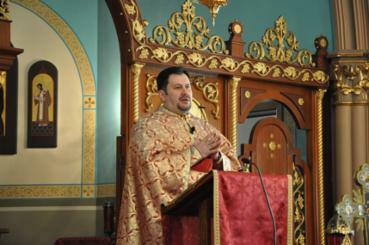 We truly appreciate Father Ihor for taking time away from his busy schedule to offer this mission. 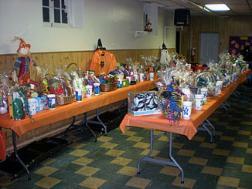 The Holy Ghost Church would like to thank everyone who came to our annual Tricky Tray on Sunday, October 24, 2010. 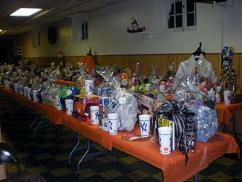 Wonderful people, prizes and food were present at the Tricky Tray---a fun Sunday afternoon for all. A very big "Thank You" to our Tricky Tray sponsors and parishioners who generously donated items and time to make this event a big success. We hope to see you all at our Tricky Tray in 2011! 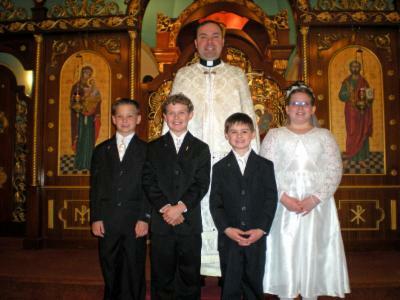 Congratulations to (l to r): Ryan Mattes, Christopher Wynne, Garrett Stoken and Talia Thatcher on receiving the Sacrament of Penance on April 25th, 2010! We pray that they grow in their faith always keeping our Lord and Savior Jesus Christ in their hearts. Although we had a chilly, overcast day for the Easter Egg Hunt on 29 March, over thirty children had a wonderful and fun Easter Egg Hunt with lots of candy, prizes and food! An extra-special visit from the Easter Bunny made the day special and memorable with lots of pictures which are available for your viewing pleasure and download. 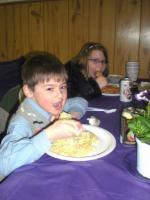 A delicious spaghetti dinner was also served in the church hall prior to and after the egg hunt. Thank you for everyone who helped make the dinner a huge success! A special "thank you" for Chrissy Mattes and Lori Wynne for planning, coordinating, decorating and making the Easter Egg Hunt and activities an afternoon to remember! Click on the 'Photos' tab at the top of this page or click here to move directly there. Holy Ghost Church held their annual Christmas Party on 23 December in the Church Hall. St. Nicholas visited the children, presenting them with a gift and blessings. It was a wonderful time to spend together with family and friends. An on-line album is available for your viewing pleasure...feel free to download any or all photos. Click on the 'Photos' tab at the top of this page or click here to move directly there. The annual Christmas Party was held on 23 December 2008 in the Holy Ghost Church Hall. The event was a special time for the children to participate in arts and crafts projects, enjoy the Christmas cooking and sweets, and sing Christmas carols in preparation for St. Nicholas' arrival. Following a Christmas story that was read to the boys and girls by Father Petro Zvarych, St. Nicholas appeared with blessings and a gift for each child. Holy Ghost Church held an Easter Egg Hunt & Party on 16 March 2008 in the Church Hall. An Easter egg hunt was held outside...luckily the rain had stopped! 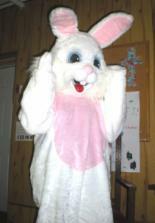 The Easter Bunny appeared during the egg hunt to watch the boys and girls find the eggs that he had hidden on the church grounds. He also spent time with everyone in the Church Hall and had pictures taken with the boys and girls. It was a wonderful time leading up to Holy Week 2008. The album above is available for viewing the pictures and also for downloading any that you wish to keep or print. Enjoy! Just prior to St. Nicholas' visit, Father Petro read a Christmas story to the young boys and girls. The children listened attentively and thoroughly enjoyed the story---paying particular attention as to how they can prepare for the upcoming Christmas season. 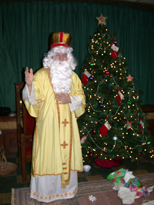 St. Nicholas visited the children gathered in the Church Hall of the Holy Ghost Ukrainian Catholic Church on 9 December 2007. St. Nicholas praised the children for their good behavior, hard work and faithful prayers. Nicholas presented the children with gifts, prayed for them and blessed them. Everyone had a good time. The children are already anticipating St. Nicholas' coming next year!